ALBÉNIZ, ISAAC. (1860-1909). Spanish pianist and composer. AMusMsS. (“Isaac Albeniz”). 1p. Folio. 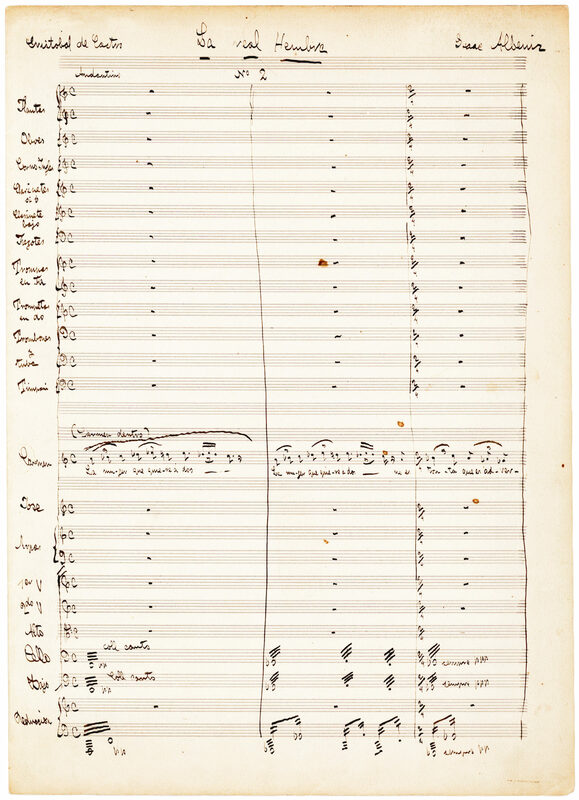 N.p., N.d. A fragment of the full orchestral score, including lyrics, for his unfinished zarzuela, La Real Hembra. The opening three measures for 20 orchestral parts including flute, oboe, English horn, clarinets, trumpet, trombone, tuba, harp, violins, cello, and bass. A child prodigy, Albeniz performed across Europe and the Americas before giving up a successful concert career and committing himself to composition. 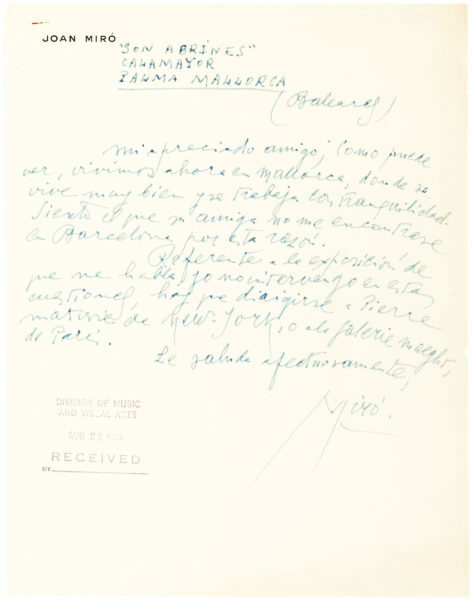 As a result, he became “one of the most important figures in Spain’s musical history… [helping] to create a national idiom and an indigenous school of piano music,” (The New Grove Dictionary). While living in France, Albeniz formed professional alliances with D’Indy, Ravel, Fauré, and Debussy. 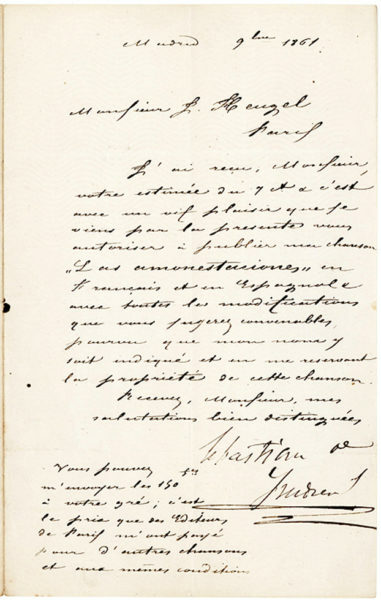 However, he “was not simply a follower of the French school… he was a friend of the French composers, exchanged ideas with them and himself helped to create the impressionist style. His piano writings directly influenced Debussy and Ravel,” (ibid.). Albeniz’s influential works include the Suite Iberia and Pepita Jiménez. Although he never wrote for guitar, Albéniz’s works have become staples of the classical guitar repertoire, especially his Asturias (Leyenda), Granada, Sevilla, Cadiz, Cataluña, Córdoba, and Tango in D.
In 1902, Albéniz “committed to writing a zarzuela entitled Le real hembra (The Royal Woman) on a libretto by Cristobal de Castro [identified by Albéniz at the upper left of our manuscript], a journalist in Madrid,” (Isaac Albéniz: Portrait of a Romantic, Clark). But Castro “finished only the first act of the libretto for Le real hembra before leaving town and losing interest in the project. Albéniz got no further than the prelude and first two scenes,” (Isaac Albeniz: A Research and Information Guide, Clark). Written on the folded first page of a sheet of 28-stave music paper. With scattered staining wear, otherwise fine. 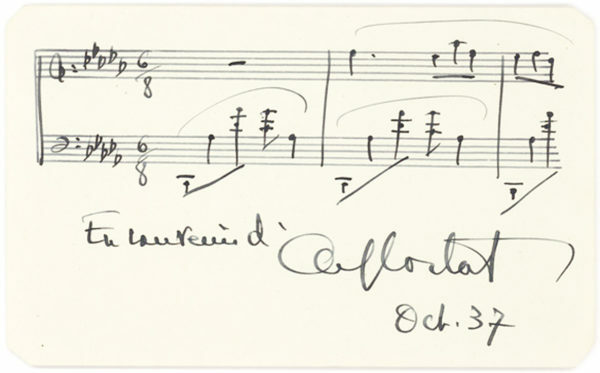 Manuscripts of Albéniz, who died of kidney disease at the age of 48 are rare.